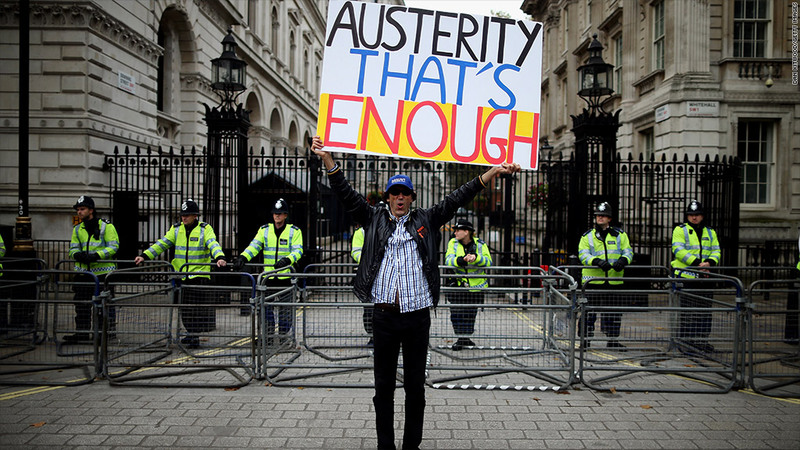 The U.K. government pledged to stick to its program of austerity even as sterling extended a recent slide Monday after the country was stripped of its AAA credit rating. Moody's cut its rating to Aa1 late Friday, saying growth would remain weak into the second half of the decade, making it harder for the government to deliver on its debt-cutting targets and undermining the ability of the U.K. to withstand future shocks. "Britain has to stick to the course, and we will," finance minister George Osborne wrote in The Sun newspaper on Sunday. "For we've had a stark reminder this weekend of the single most important truth about our economy -- Britain has a debt problem, built up over many years, and we have got to deal with it." Moody's said it expected the U.K.'s debt to peak at 96% of gross domestic product in 2016, up from around 90% today. A downgrade had been talked about for months, against the backdrop of a deepening recession in Europe and Osborne's acknowledgment late last year that borrowing would remain higher for longer than expected. But it still served as a reminder of the poor growth prospects for the world's sixth biggest economy, and added fuel to speculation that the Bank of England will have to compensate for the lack of growth -- and the government's hawkish stance on fiscal policy -- by easing monetary policy still further. Investors took the downgrade as another reason to sell sterling, extending a slide which began at the start of the year. The currency dropped 0.1% to its lowest level since July 2010 against the dollar, and 0.6% against the euro to levels last seen in October 2011. Yields on 10-year government bonds have been rising for about six months and they ticked higher again Monday to 2.1%, still low by historical standards. The Bank of England has signalled recently that it may be prepared to tolerate above-target inflation for longer, while growth remains weak. Three members of its monetary policy committee -- including outgoing Governor Mervyn King -- voted at its last meeting to expand its bond-buying program. They were outvoted, but the previous time the committee split 6-3, the bank followed up at its next meeting with more monetary stimulus. Osborne said Germany and Canada -- the only big economies still with AAA-ratings from all three major agencies -- had taken advantage of better times before the financial crisis to reduce deficits and make their economies more competitive, while Britain had built up the biggest structural deficit of all. "Now we have no choice but to continue the hard work of putting our house in order," he wrote.